Bojan Otašević, Slave - Mercy (2018, algraphy). Bojan Otašević, painter and printmaker, is almost two decades present on contemporary art scene. He has strong author’s attitude, and his convincing expression is recoznizable and appreciated among artists and art critic. Otašević uses close-up; his compositions are reduced and usually focused on one figure. In portraits, which are dominant genre in his works, he is interested in psychological states of Man which are articulated with expressive gesture. He creates visual typology of wide range of emotions which reflect inner experiences and anxiety of contemporaneity. 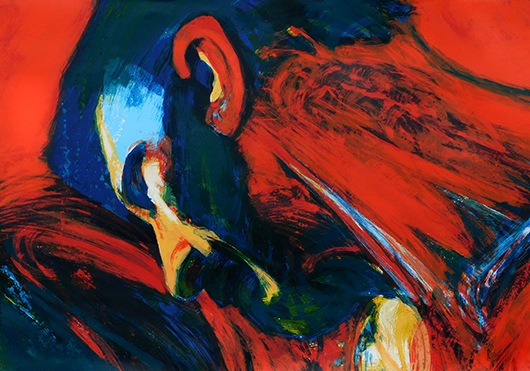 Awarded work „Slave-Mercy“ is specific study devoted to Man, characterized by strong gestuality, intensity of color and dramatic colored contrasts. Otašević strives to delete medium borders between painting and print. Author successfully uses all potentials of litography and algraphy.